Hampton Sailing Club is one of the most successful and active clubs in the area, with a real family club environment and an active social side. The Club was established in 1944 with 28 founder members including Peter Heath who is also currently President of the Hampton Riverside Trust. 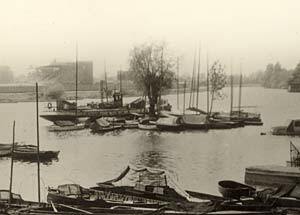 In 1945 the fledgling Club leased the tiny Benn’s Island from the Thames Conservancy with the right to moor a large boat there to act as headquarters for the Club. In 1951 “King Edward” was purchased as a clubhouse ship and moved to the island. The vessel was used as Club headquarters until 1962 when the clubhouse was built on piles at Benn’s Island. Since that time the building has been extended and altered several times. Facilities include a bar and large picture windows with panoramic views of the river as well as the more practical facilities of changing rooms, boat storage etc. The decking used for storing boats now completely covers the small island. A chain ferry connects the island with Benn’s Alley (off Thames Street). In recent times additional boat storage has been obtained by the lease of the vicarage riverside garden in Thames Street. Individual class racing is organised for GPl4's, Merlins, Lasers, Enterprises and Handicap boats (e.g. Mirror, Optimist, Graduate, Kinsman, Byte, Heron). The Sailing season usually begins on the third weekend in March after the Fitting Out party and closes with a race for RNLI pennants on Boxing Day. The season is split into 4 Points and a Frostbite series each with their own individual trophy and supporting prizes. Sunday is the main race day. Proceedings during the Points series start at mid-day with a handicap race for all classes followed after lunch by individual class racing. The Frostbite is a series of morning races for individual classes. 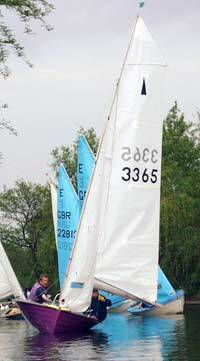 Throughout the season the club holds Open Meetings for all class boats and these often form part of regional or national class programmes such as the Thames Traveller series for Lasers and Enterprises. There is also a two day summer Regatta and a number of special and fun events.